I’m continuing to participate in WEGO’s Health Activist Writer’s Month Challenge. Today’s prompt is to toast our favorite social network. 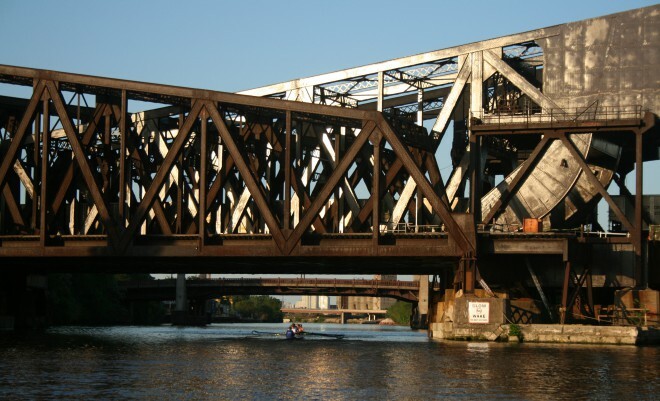 I have a thing for bridges. I don’t have many pictures of them, which is odd considering I like to photograph my favorite people and things, but maybe that is only because I am usually driving on or under one. Regardless, I find them fascinating. I like the lines, the shadows they create, but most of all I appreciate what they do: they bridge. Because of the relatively close proximity of the Caribbean to the US, I had a number of visitors from home that ventured to visit me when I was a Peace Corps Volunteer on Antigua (1992-94). My parents and sister had dinner at my homestay mother’s home and old friends from home got to hang out with new Peace Corps and Antiguan friends. I also corresponded regularly with ‘home’ through frequent letters and phone calls (the phone calls were infrequent during my first 18 months, but I had a phone installed in my home for the last 6). I was bridging my old home to the new. When I returned to the States, specifically Michigan in 1994, I reversed the traffic on the bridge. I got a job as a Peace Corps Recruiter with the most supportive work environment I have ever experienced and stayed in touch with a number of my new family and friends on Antigua through letters and telephone–and then email. As I shared my Peace Corps experiences and learned about others’ PC experiences through my co-workers while on the job, I continued to bridge my old and new worlds, building a network of connection to Peace Corps that went way beyond my two-year PC tour. Fast forward to December 28, 2006 and September 18, 2007, when I officially joined Ancestry.com and then Facebook–my favorite social networks. From the get-go, they both bridged my present to my past. Initially, they bridged me to my more immediate past. However, within time both networks have expanded my world in ways I could not have imagined. The World War I love letters of one set of my great-grandparents became the basis for my Masters Essay. In order to make sense of these letters, and all of the people mentioned, I had to create a family tree, a cheat sheet of the key players in my great-grandparents’ lives. Ancestry helped me to facilitate this process and then kept me engaged, long after my essay was done. Yes, Ancestry has linked me to a plethora of records related to my ancestors, but they also link you to others who share your ancestry and this is what has been invaluable to me and my research. Besides being able to trace a number of lines of my family tree into the 1600s or beyond with the help of the research of others, I have actually met in person a number of relatives that Ancestry has connected me to. One of the coolest treats, however, had to be last year when I connected with a very distant relative in England who happened to have a picture of my Grandma’s grandmother that I had never seen before. 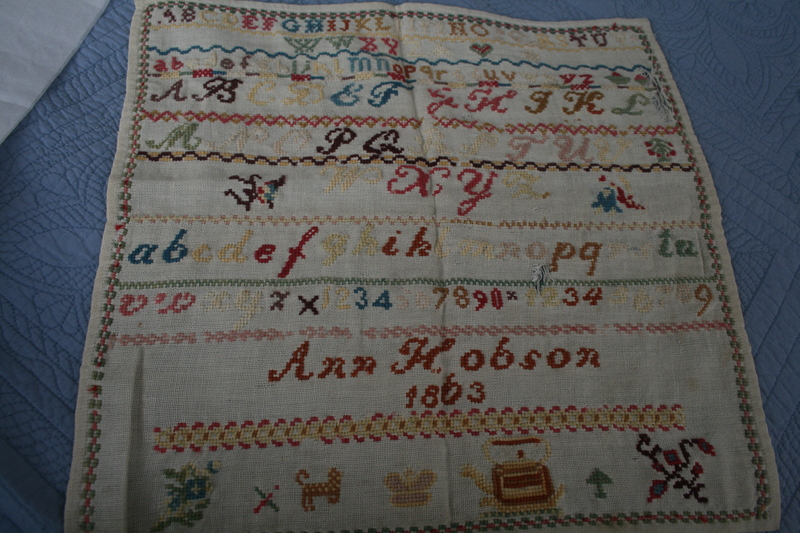 When I contacted him, it turns out that he not only had the picture in his collection but he also had the 14 x 14 sewing sampler of my great-great-great grandmother sewn in 1863! The best part? He sent it to me! My other favorite is Facebook. I can’t believe that I’ve been using this network for 5 and a half years! I’ve connected with friends and former colleagues, relatives, former students and teachers (! ), and even the children of my former Antiguan co-teacher. It visually speaks to me, I appreciate the updates of my contacts (and if not, there are controls to restrict my contact), and I find many of the posts and articles that are shared to be thought-provoking, insightful and interesting. Check out this column from David Brooks on The Outsourced Brain which was my first shared article on FB. I appreciate that this network has grown and changed with time, bridging the old and new in my life. It represents balance and a ‘fullness’ to my world. Shwew! This was going to be a quick post! Too bad Twitter isn’t my favorite and I would have kept my post at 140 characters! This entry was posted in Uncategorized and tagged #HAWMC Day 11, social media favs. Bookmark the permalink.